Early in 2018, I was asked by a Sturgeon Country representative to participate in an event that would commemorate the 100 Anniversary of Sturgeon County’s incorporation. She asked if I would be willing to display my area inspired artwork at this outdoor party. There was no charge and it sounded good to me because I already had a decent amount of inventory prepared. 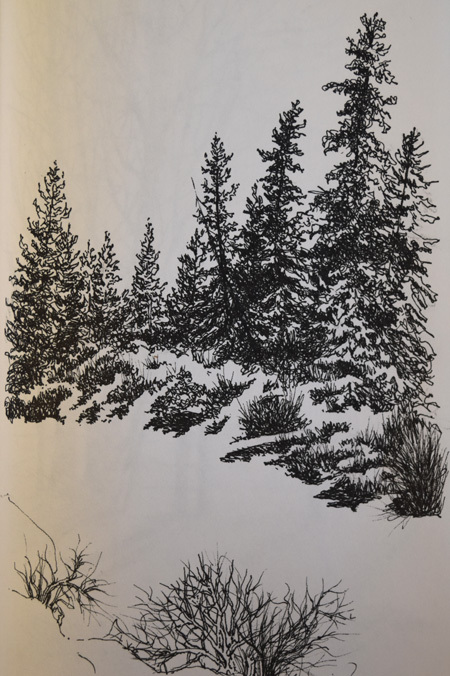 This was long before I was drawn to sketch in the way described below. 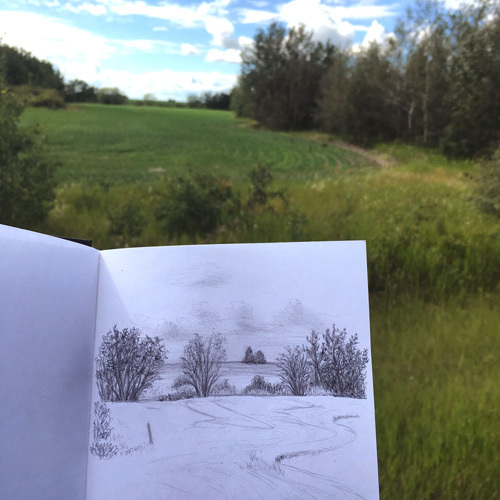 One of the spots where I was drawn to sketch what was in front of me. During these occasions, I was often asked by passers by if I was ok and if I needed help. When they saw my camera and sketchbook, they would wave and continue on their way. At the county’s main office, I came across posters encouraging residents to take on certain challenges to celebrate the milestone. Ideas ranging from reading 100 books to taking 100 photos were suggested. That was a novel idea. What could I do that wasn’t already on the list? The idea came quickly. 100 sketches was right up my alley and would be cool to do! But I was a bit apprehensive about it because of concerns about time constraints. Still, I was drawn to sketch local! Can we really plan for life’s anomalies, the agendas of others and how everything might affect our time and energy in the future? 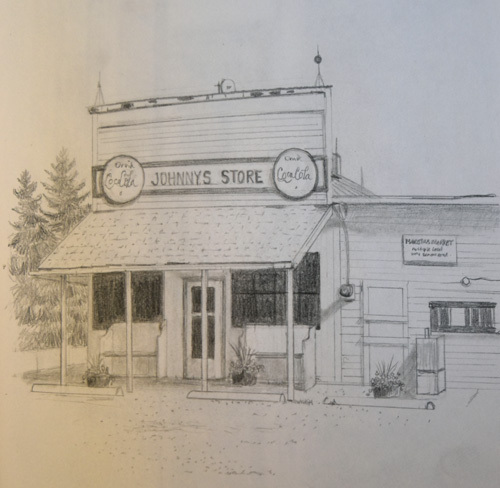 In March I really felt that it would be no problem to complete 100 sketches of Sturgeon County before the main centennial celebration event on September 8. And so, I began the project with a couple of drawings from photos already residing in my huge stash of references. Soon after, I began sharing my project with others which solidified my commitment to the project. 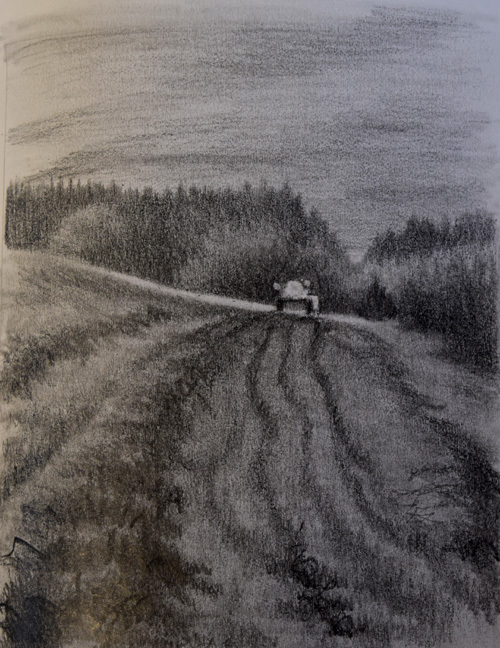 I stole away down the road in my little old van as often as possible searching for interesting places that I was drawn to sketch on the spot or gather photos to use whenever life drawing from life was not going to be possible. Spring and summer was extra busy with a lot of farm projects and other family concerns. As a result, only 40 pages out of 100 were completed by September 8. A little disappointed, but determined, I kept at it and declared December 31 as the new deadline. Periods of intense focus on the project made it happen! Time and undivided attention always seems to get the job done. Even though I had lived in this area for 40 years, the thought of actively exploring the county itself, never occurred to me. On the other hand, I have regularly gone on reference gathering missions through out the years. 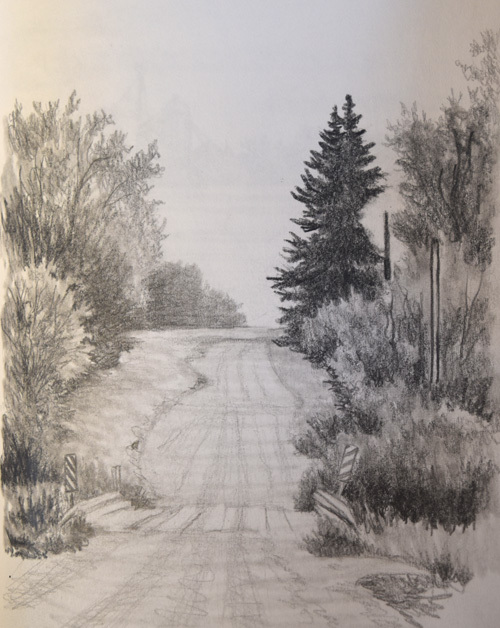 For quite some time, I thought that it would be wonderful to scout out many of the back roads of Alberta. Now I understand just a little more clearly the magnitude of such an undertaking! Sturgeon County, a small part of Alberta, is actually huge when you drive the grid at a stop and go pace, taking copious photos! The idea of seeing Alberta this way is still intriguing so we’ll see where the road of life takes me. I was impressed by the diversity in industry, flora and fauna, landscapes from flat to almost mountainous hills, rivers, valleys and dusty hilltops. Heavily mined acres (which were totally uninspiring to me) and heavily treed areas that I never wanted to leave; it was amazing to experience all of that variety in a confined area. Among all of this, ruins and relics of various flavors were quite common, which I found drew me in many ways. I wanted to hear all of their stories. There were also a surprising number of mansion style residences with fancy gates and gardens and tiny farmhouses, still sheltering active farm families. I was disappointed that I left the north eastern part of the County unexplored and unrepresented in the book. It would take another year for me to tour all of it. Through this little journey, I have come to appreciate the beauty of where I live even more. I would urge everyone to explore the areas near to where they live and develop a deeper love and appreciation for what is right in front of them. Flying to exotic locations is a wonderful thing to do, but it is equally enriching to get intimate with one’s own surroundings. I plan to do more of this. 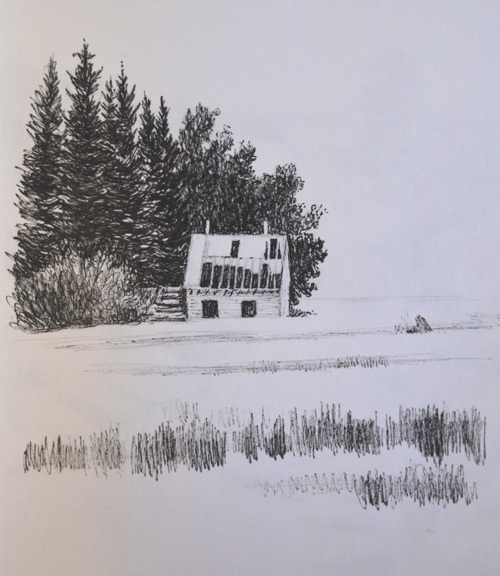 Here is a link to a three minute video showcasing all 100 of the sketches that commemorate Sturgeon County’s Centennial year. Talking and thinking about this for almost a year, I almost can’t believe 100 drawings were completed!. Since the book was not ready for the September main event, I wondered if there was a way to share all of the work and the results of this project. Why not an online, flip through the book video? It was a lot of fun to do this project and through this process, my drawing skills were improved upon. As I moved closer to the 100th mark, it felt like it was high time to get it completed. There you have it! Here is a link to my newsletter that contains more photos and a video about this project. If any of these sketch locations seem familiar, let me know! I would love to hear from you. This entry was posted in Alberta Landscapes on January 16, 2019 by Judy Schafers. The 2018 farming season was another challenging one. A prolonged harvest wears workers out. Even though it was a productive season, it was quite tiring and more stressful than usual. Farmers tend to live in next year country and we are already looking forward to a better growing season in 2019. The current set up for the grain handling yard. It will no doubt evolve and become more efficient. Somewhere in this photo our son, Devin and helping hand, Jerry are unloading grain. We got off to cool start in the spring and once it decided to warm up, it sure did! 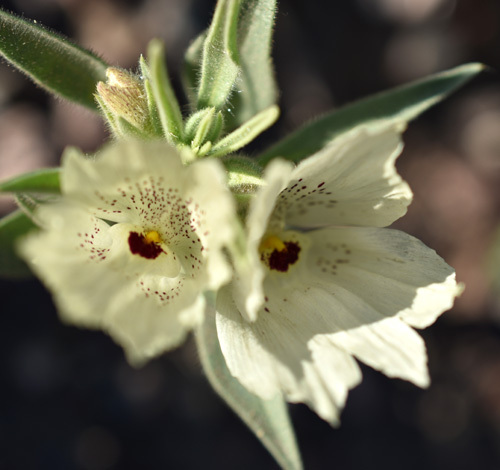 Throughout the spring and summer there were prolonged periods of drought-like conditions, followed by just enough rain in just the nick of time. 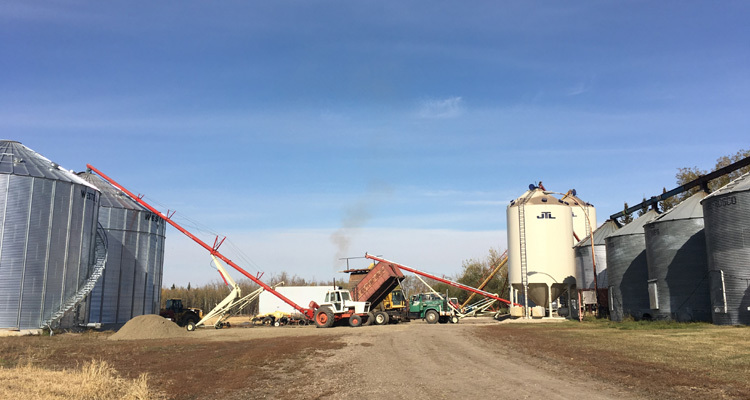 Because it was decided that we needed a few upgrades in our grain handling system and main workshop, we weren’t quite set up and ready for harvest. A few details got derailed such as the later than promised arrival of our new bins, which caused a delay in completing the proper set up of our grain dryer. But, like most business owners in a bind, interim solutions were found. 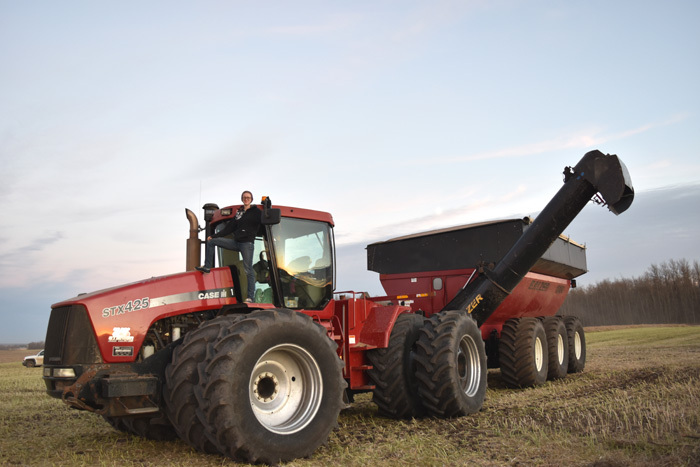 I caught a ride in the tractor with Jilene after delivering supper one evening. Here you see Shane dumping the grain into the cart. The nasty weather in September allowed Devin and Shane some time to get the grain dryer operating well enough to get through the season. That was something to be thankful for. But at times it looked and felt like we would never finish combining and have to get what was left of the crop off the field in the spring. This happens to many farmers, but so far, has not happened to us. Knock on wood…. We seriously wondered if this year would be the first! Jilene on the tractor waiting for more grain. There were lots of late hours and lots of time off due to rain and buckets of snow and winter-like cold that just did not want to loosen its grip. 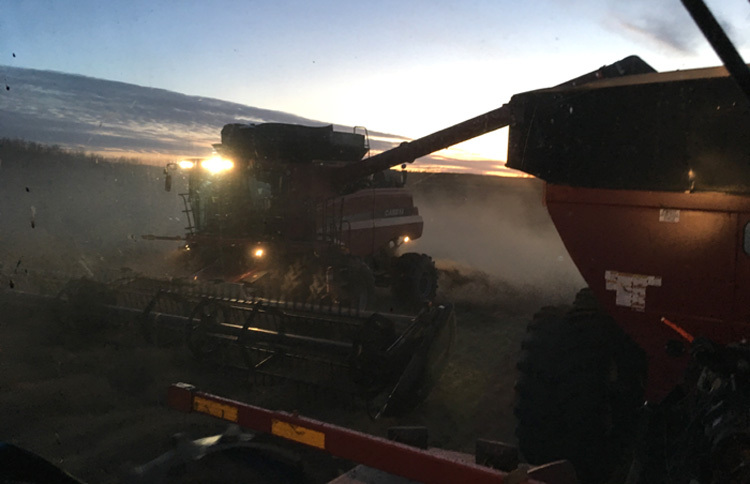 Shane was finally able to get the canola finished on October 24 which is two to three weeks later than most years. Even after all of that, we still did not know if the harvest was complete. There were still 130 acres of fava beans left in the field. They were just not ready to combine even after a hard frost, which usually does the trick. Now in December, they are still in the field and will remain there until spring. One of our neighbors may be able to use them for feed, but it is more likely that they will be worked into the soil. This is what the kitchen looks like during harvest. This is after I had delivered meals to the field and was just about to do the dishes. Even though we did not get all of the crop off of the field, we are beginning to recover and have since moved on to other things. We are sure hoping that next year we will not have to face another prolonged harvest! This entry was posted in Life and Art on December 12, 2018 by Judy Schafers. Despite the very late and stressful harvest, all the parts and pieces of putting on a show came together. A shout out goes to my kids and some friends, who played a big part in making it happen! My daughter Jilene and her boyfriend Oso, hung the paintings for me while I went to the salon for a much needed haircut and other errands. They did a fabulous job, and I requested a couple of small changes when they were almost finished. We laughed about that because I had mentioned to them earlier that I was taking a hands off approach. They were in charge of arranging the display and I was not going to get involved. Came really close, but couldn’t totally help myself! The night before the opening, I sat down and took in the scene before me. It felt good to acknowledge all of the accomplishments that had taken place in the two years previous. It’s always a satisfying feeling to view the studio once most of the work of putting on a show has been done; a good point to sit back and celebrate all of my team’s and my efforts before guests come through the door. The weather cleared up just enough and just in time for guests to feel fairly comfortable navigating the winter-y roads. The area had been hit with freezing rain and cold temps the day before. A concerned neighbor had brought us a large bag of ice melt to spread around on Saturday morning. Thanks so much for your thoughtfulness, Glen! Other neighbors and friends, Yolande, Alice, Hedy and Pascha, brought goodies for the table. More friends, Julie, Karen, Oso, Devin and Jilene, helped with handling sales, refreshments, greeting guests and various other tasks. All of the help I received made a huge difference in my being able to enjoy the weekend and focus on my guests. Seeing everyone who came through my door was fun and heartwarming. 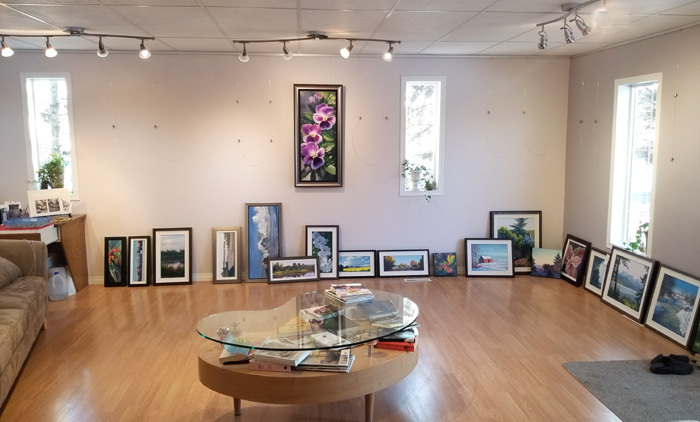 It was such a pleasure to connect and visit at least a little bit with each person and I am grateful for all of the support they gave me by attending and also purchasing artworks. I was surprised by the number of new people who dropped by because of friends who had shared the invitation! 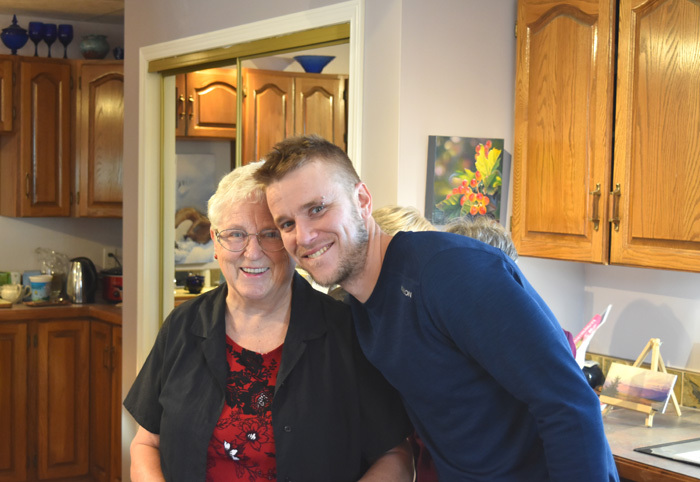 My mother-in-law, Marian and our goofy son, Devin. Many memories were made and even better, all sorts of surprise reunions took place during the weekend! In some cases it had been over 20 years since we and some friends had seen each other. A few relatives on both sides of my family were also able to re-connect. I have come to understand that this is what it’s all about. 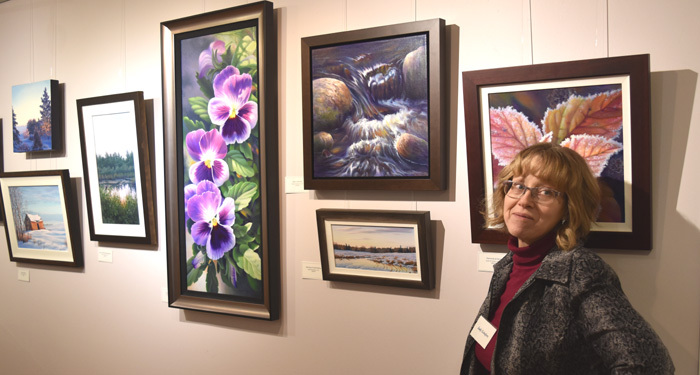 Making connections with others through the sharing of art and hosting or attending these kinds of events is good for the souls of all who participate. After the first day was over. Photo thanks to Oso Steen. 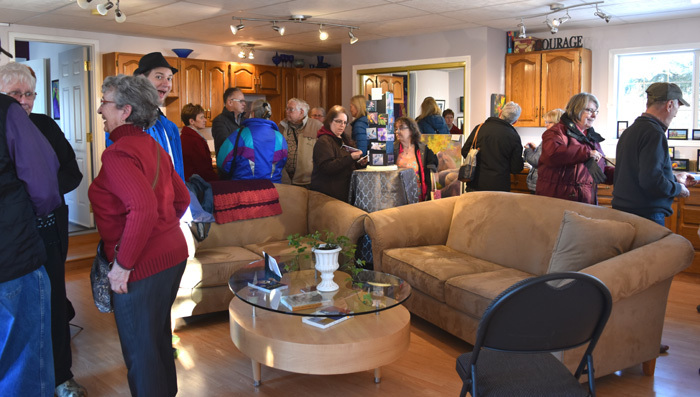 Over one hundred and ten people attended my show and twenty one original pieces (mostly miniatures) found new homes. Even though this tally is quite a bit less than in previous years, I am glad we made the effort of putting on a show. 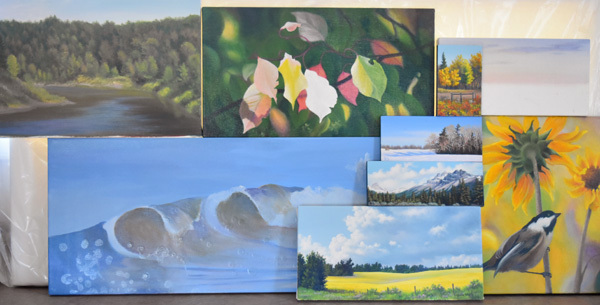 I am planning to do another summer event in 2020 with many new paintings and items to show you. I am also looking forward to all of the stories that will be created through the process. It’s time to get painting! This entry was posted in Life and Art on December 11, 2018 by Judy Schafers. I learned early in life that creativity comes in many forms, not just with painting and drawing. My Aunt Gisela was one of the creative people that influenced me as a child. 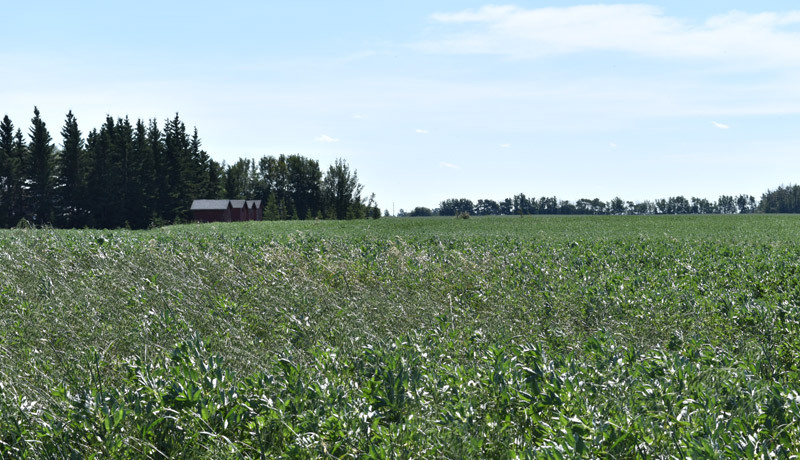 We were neighbors in the Highridge area; a tiny blink and you’ll miss it, quiet sort of rural community in the rolling, rocky hills of north central Alberta. 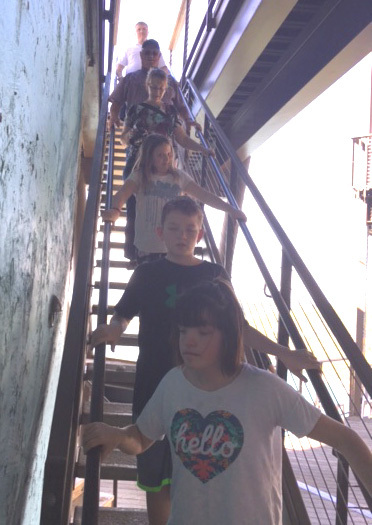 Living in the same neighborhood made it easy to participate in the many activities that she facilitated. 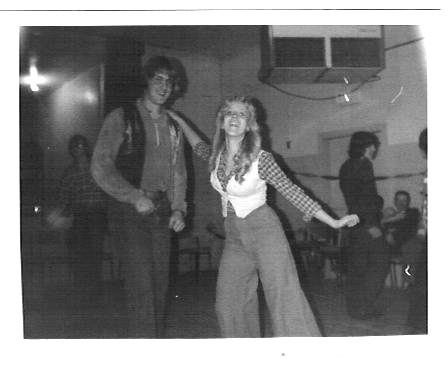 This is during one of the dance classes inside the Highridge Hall that my Aunt organized. Here I am pictured with my Aunt’s son, Gary. I was a little older in this photo than when the play took place. Gisela would often be the one to organize activities for the small community which would usually take place in the Highridge Hall. Among a few of the activities offered were sewing classes, powder puff mechanics (taught by my Dad) driver education courses, cake decorating and dance classes. If my Aunt didn’t come up with the idea and make it happen, she and her family were at least participating in the event and often signed my family up, even if we resisted. As far as I was concerned, my Aunt had a creative imagination and always had something fun going on. She and my Mom were best friends and would often talk my mom into getting involved in pursuits outside her comfort zone. It was good for my mom and it was good for me. I learned a lot from her way of looking at life, her keen interest in learning and trying new things. Taking part in those activities formed some of my best memories growing up and helped to give me a sense of community. I also remember her love for composing rhyming poetry, and how she would ask my family for an audience to test out some of her drafts. We’d be either rolling our eyes or rolling on the floor with laughter! One of the projects that she initiated and one I remember quite clearly, was a little more ambitious than usual. It involved, not only composing a poem, but creating a play from it. It was entitled “A Day Well Spent in the Highridge Hospital. I must have been about 9 or 11 years old at the time and was already exhibiting some artistic skill. She encouraged the development of my abilities by asking me to help with making the signage for the play and some of the props. I got an acting part as well. We had a few practice runs which didn’t seem like a lot of work to me, but I am sure it actually was for the adults. The rehearsals were a riot with all of the little mishaps that took place and we received a lot of laughs from the audience during our presentation. A hospital room is suppose to be a quiet space, but you wouldn’t get that impression form the animated performance. It is a shame that there is no video of this little play as I am sure that it would bring as many laughs now as it did then. I stumbled across this handwritten poem when I was cleaning out the basement a few months ago. It took me a while to figure out what I had found and I was pretty excited to see it again after so many years. Reading it brought a smile, a few tears and a flood of great memories! As you read her poem shown below, try to imagine youngsters from ages 6 or so to about 12 or 13, acting out the scene, dressed in makeshift costumes using old cots as hospital beds, trays on squeaky wheels and all kinds of sound effects. There might have been a ‘patient’ (my cousin?) with a thickly bandaged leg that was some how suspended in the air? It is interesting to note the way a hospital stay is described and how much has changed or stayed the same, since almost 5 decades ago. Did you take your pills tonight? Next come all the breakfast trays. “Sorry, none for you today”. Then our beds are pulled apart. Off we are to an early start. “Did you take your bath today? When you’re in pain, a shot comes handy. For a while, all is so still. Then comes a nurse, “Here’s another pill”. Then they watch you while you swallow it. And Down it goes into the pit. Here an “Ouch” and there a “Squeal”. And we wish for a peaceful day. Then the dinner trays appear. There’s no use to ask for more. In they come to dust our nest. Hours drag by oh so slow. Now I hear a wagon clatter. “Juice is early, what’s the matter? I’ll take grape, cause it’s the best. Pill again, then supper time. Some walk fast and some in slow gear. “The time flies by, the loved ones leave. The juice comes slowly rolling by. “Like a cookie?” comes the cry. Then wait for old Doc one more time. He’d better come or it’s a crime. The beds are made, the backs are rubbed. We’ve said good night to one another. We’re off to sleep, no one to bother. We’ve had some tears and some good laughs. And think you’re all a bunch of pals. Cannot be found and that is true. It’s an interesting, tiny snippet of the culture of that era. I am really grateful for the experiences Aunt Gisela gave us and for using her form of creativity to help strengthen a community . It must have taken a bit of courage, lots of energy and hard work to fit these extra activities into the busy family and farming life that she had at the time. 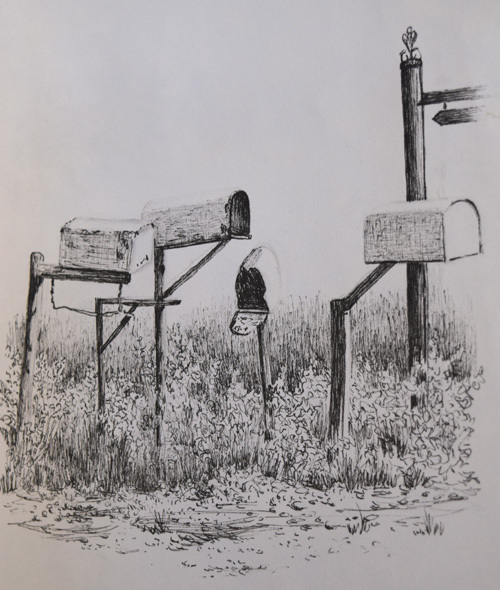 This entry was posted in Childhood Lessons on March 27, 2018 by Judy Schafers. When would be a good time for me to sneak away? Kidnapping some time for myself had been on my mind for quite a while. There is always so much happening on the farm during spring and summer that it felt like a break was long overdue. Where could I go that would be quiet and comfortable enough for me to accomplish a few things of my own and also get in some R&R? After some focused thought on the question, a sweet little plan emerged! The kind of solo getaway that I dream about. Just me and nature! It’s about kidnapping some time! At least 20 years had passed since I had gone away for some solo time. Being somewhat of an introvert, this type of kidnapping some time is something I often dream about. My daughter, Jilene, encouraged me to take the idea seriously and not just let it slide as I tend to do. Since Shane (my husband) had recently gone on a four day fishing trip with his buddies and a couple of out of province auction sales, my thinking was, “Fair is Fair”. I made a deal with him and he didn’t seem to mind the idea of me leaving everything behind for a little while. Besides, what could he really say? Our daughter would look after meals and our son would be working on the farm with his dad. He’d be fine. What is an Artist in Residence? Throughout the years, I had heard about artist in residence programs. but had never applied for one. 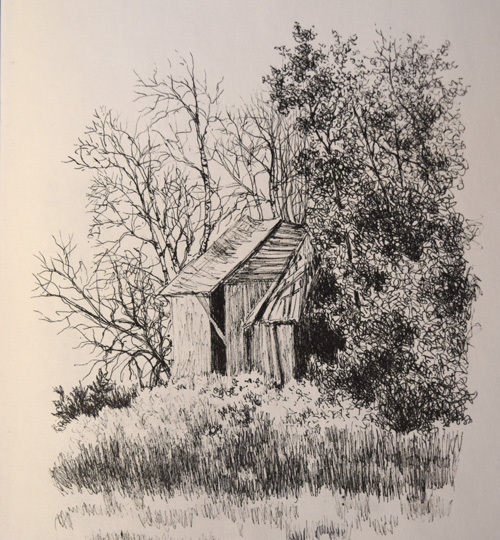 I knew many artists who had taken advantage of such opportunities and they reported coming away from the experience with more confidence and growth in their art practice. This is kidnapping some time with a defined purpose. 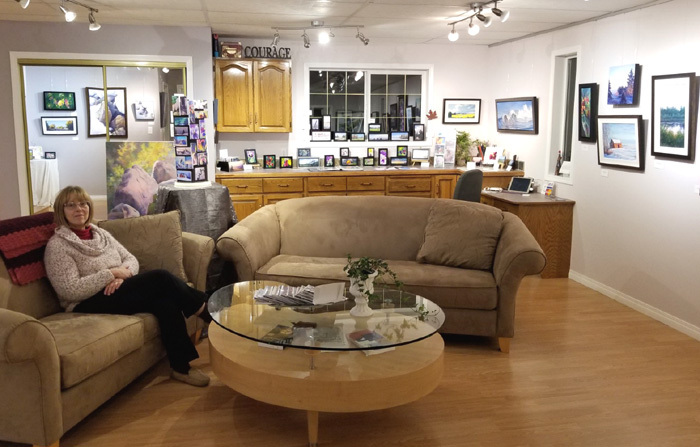 These Artist -in-residence programs exist to invite artists, and all types of creative people for space away from their usual environment and obligations. They provide time for reflection, research, presentation and/or production. For some reason, I always felt like the whole concept was too much of a commitment for me. “So why not set up an ‘artist in residence’ of sorts, for myself?”, I thought. A kind of informal one, but where there are no forms to fill out, no competition with other artists for the opportunity, or the need to travel a significant distance? 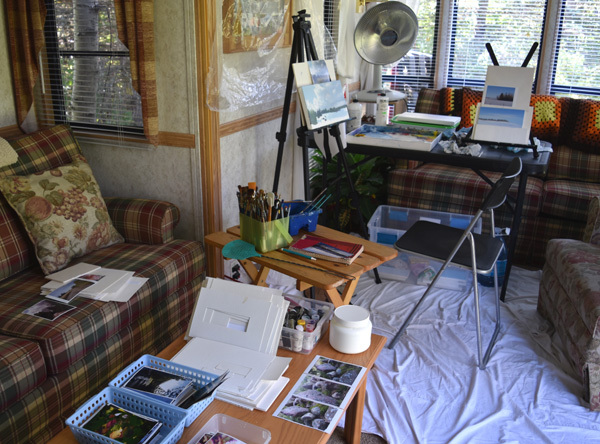 This is my makeshift studio in the living room of the park model trailer that I stayed in during my solo getaway. 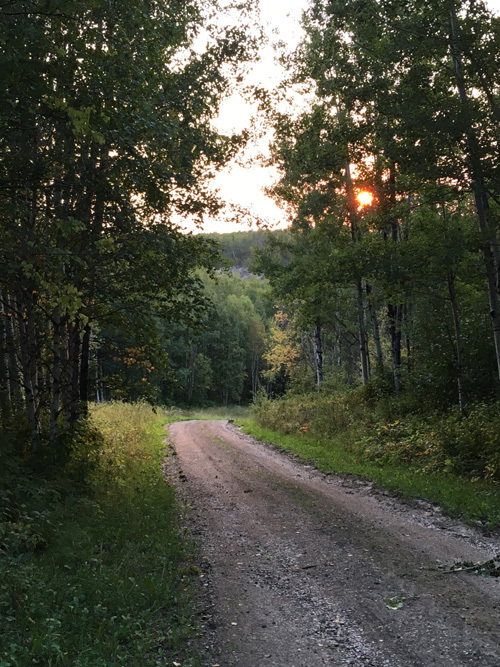 For eight magical days at the end of August and beginning of September, I stayed at a beautiful, private campground. 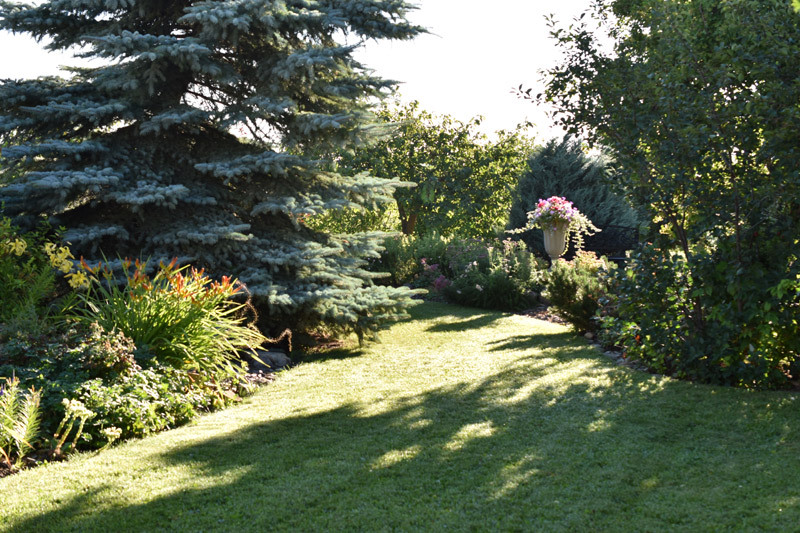 This little piece of paradise on the Pembina River was owned by a long time family friend. She offered me her cozy park model trailer to stay in and all I needed to bring was my own food, bedding, and art supplies. Perfect! In order to make the most of my time there, I set certain goals for myself. 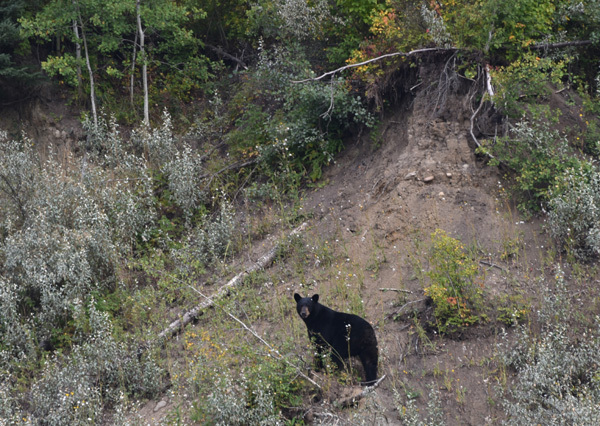 One of them was to climb the approximately 1/2 mile, 30% grade road that led down to the river at least once a day. After all, sitting and painting for hours on end was not good for my mind or body. It was pretty tough, but I managed to make this trek twice a day on every day but one. Having no reliable cell phone signal down by the river was enough motivation to get me up that hill and do the promised daily check in with my family. The light has changed drastically since beginning this painting. I will have to rely on memory to finish it. It took me 2 hours painting time to get to this point in the process. 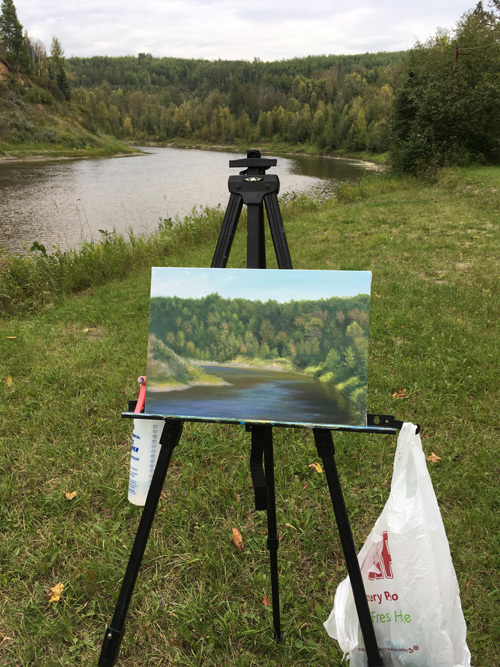 Another goal was to attempt a ‘plein aire’ painting of the river. (Photo above) This is a good skill to practice but for which there seems to be no time at home. 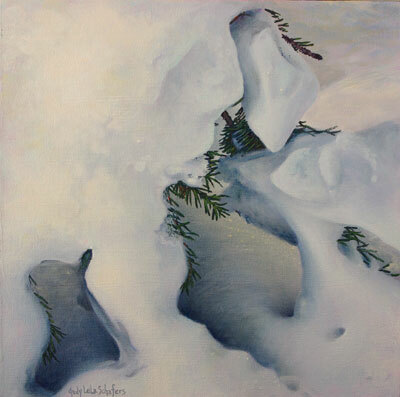 I also wanted to paint as many paintings as possible, get some reading and writing done and immerse myself in nature. As usual, I had much too long of a to-do list….. Shortly after arriving on Sunday evening, I set up my makeshift studio. There was plenty of room to spread out and start organizing painting possibilities. So many ideas, so little time; not a new problem. But how exciting! A couple of small paintings were started before leaving home so that it would be easier to get back into the creative flow. I worked on these the next day. What a treat it was to think and paint without interruption! Later that first day, I began to peruse all of the possibilities and became rather overwhelmed until I focused on the concepts that sparked the greatest amount of excitement for me in that moment. A large diesel generator provided the electricity a distance away from the trailer. For the first half of my stay, I ran the generator in the late afternoon and evening to charge my phone, keep the fridge cool enough and have the lights on for painting at night. But it was rather unsettling to go out into the bush in the dark to shut down the generator, so I decided to have it run earlier in the day. Living so near the city and the airport, I am no longer used to such dark nights. It was eerie and I was surprised by my reaction. Instead, I read by candle light and solar lantern after dark. One night, I began a miniature painting using only an led headlamp for light. It was interesting experiment that I would not recommend. It’s a good thing acrylic is a forgiving medium! Every morning, I could not wait to go and see what the river was up to. Such a scene does not exist near my home, so it was rather special and seemed to change daily. Then off I would go, on a little trek in my rubber boots down some of the many bush trails with camera in hand. I ended up taking just about 200 photos! I ate very little, did no cooking nor tidying up until the very last day there, when I did a thorough cleaning. Most days, the owner would come for a pleasant but short visit to check on what was new. In the late mornings and afternoons, I would paint my heart out. Three miniatures and a small painting were completed and 4 others had a good start. Of course, it would have been more satisfying to have completed more paintings. Every night, I would read by candle light, in complete silence, except for the sounds of nature and cattle bawling occasionally. No tv, no news all week! It was heaven! Part of the obligation that often comes with Artist Residencies is that the artist is asked to give something in return for their stay. Often the participant will create an art related community outreach project, put together an art show and invite the public or create a public art piece etc.. In this case, I offered to give the owner a painting as a Thank you gift for the use of the space and she was pleased with the prospect. It would be nice to try kidnapping some time again, but possibly for longer. I was rather surprised to be feeling a bit tired at the end of my stay. Maybe expecting so much from myself is not that wise. Can I ever learn to relax? That remains to be seen. I met a neighbor, directly across the river from where I was staying. Glad we did not meet up on one of the trails. The owner suggested I carry a bell, just to be safe. This entry was posted in Travel and Art on October 4, 2017 by Judy Schafers. It has certainly been an enjoyable summer, in my mind. There are always difficult things going on in the world, that is for sure, but I choose to focus a bit more on the wonderful abundance around me. How can I make a positive difference in the world, if I let negative influences make me miserable? And so, it has truly been an very enjoyable summer! The balance of moisture and sunshine has been almost perfect in this area which is of concern every growing season. The gardens look great! Even with the weeds. The large leafed plants above are tobacco plants that were given to us by a dear family family friend. We’re not sure what to do with them, but they certainly look happy! 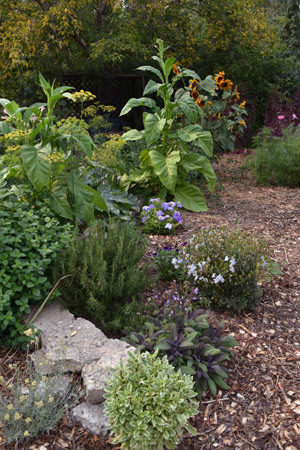 Other often used herbs such as variegated basil, rosemary and purple sage are alongside. I go produce shopping in my jungle garden almost every day. Such a joyful blessing. It looks like we are sadly going to loose a couple more of our long time garden inhabitants. 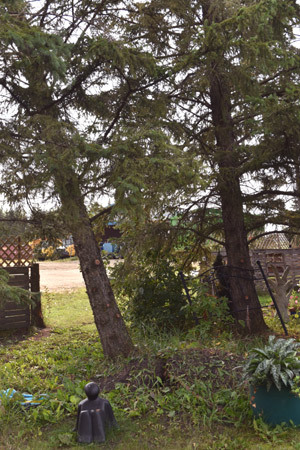 Some of the summer storms wreaked havoc on our spruce trees near the house and they will leave quite a very noticeable empty spot. They will be greatly missed. 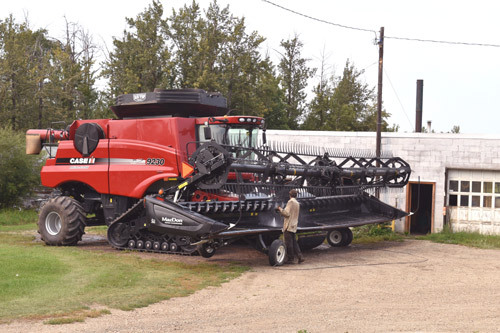 Here, our long time valued farm hand Jerry, is washing the combine and getting it ready for harvest. Every year it seems to come so quickly! Some of our neighboring farmers have begun harvesting this week. Mushroom were everywhere this year! Jilene has a large mushroom book that she uses to identify them. 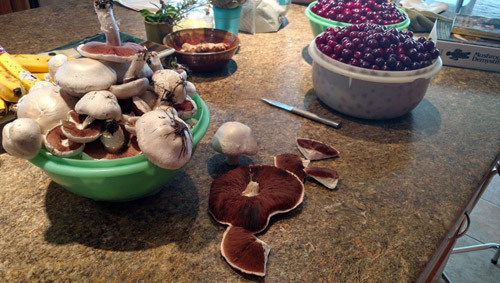 We made delicious cream of mushroom soup with these! Another first 🙂 Oh, and the cherries and raspberries were almost never ending! The freezer is full of fruit. I am just finishing with the apples and the plums are next. This is a breathtaking view, in my opinion. 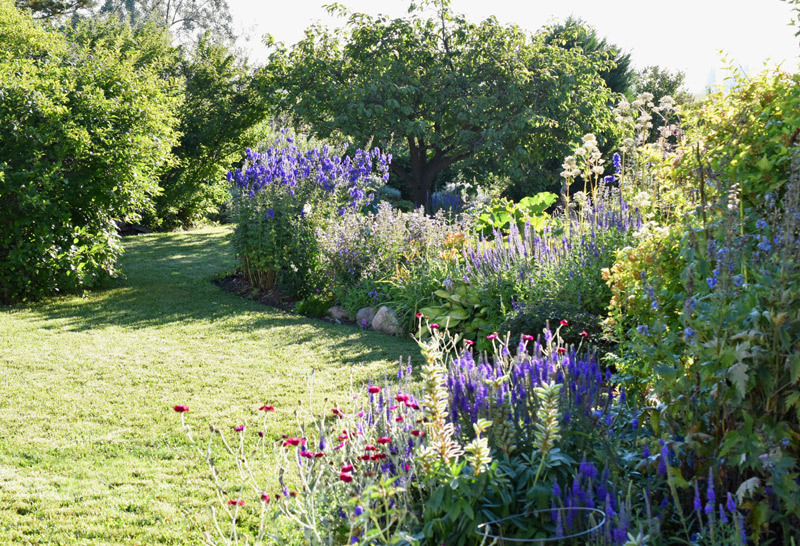 Who doesn’t love the flower garden blues? Did I mention how much I love flowers? 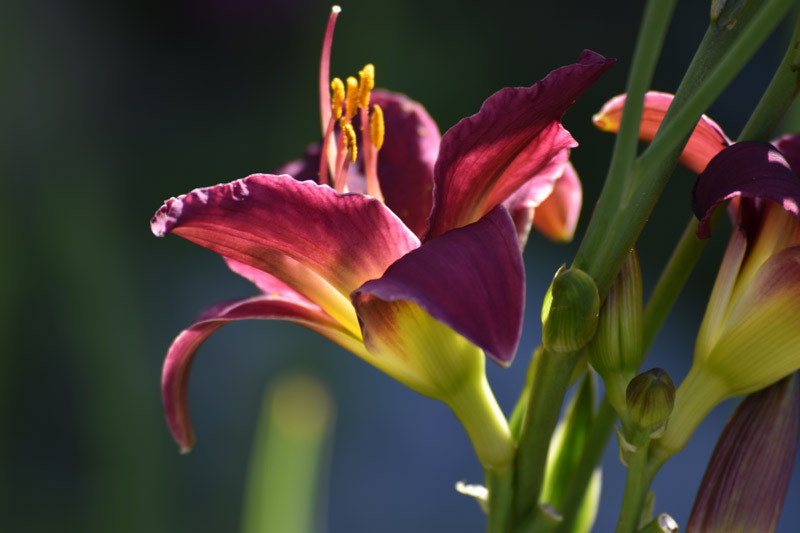 This is a burgundy daylily with green accents. I might just paint this some day. Ok. Just ONE more garden photo! I love the early morning shadows. This entry was posted in Uncategorized on August 25, 2017 by Judy Schafers. Even with our best laid plans, curve balls can appear out of nowhere , as we all know. 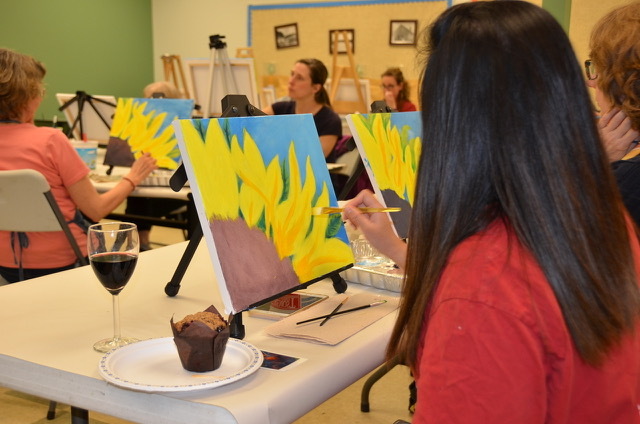 Paint Nights have been a popular activity in the last couple of years. I had been wondering recently, what it would be like to put one together. How challenging would it be? Could I pull it off successfully? 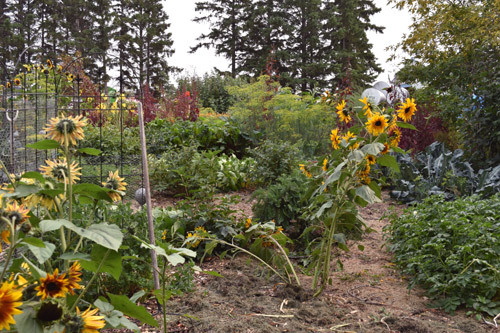 The St. Albert Urban Agriculture group was looking for a fund raiser to purchase the plants and materials needed to expand the community food forest. Since growing food is something I love to support, it was an easy fit for me to pitch in and facilitate a Paint Nite event for them. But, I had never instructed one before. I had not even attended such an event! I had no idea about what I was getting into…. It was exciting to think that some of my skills could be used to help others and help me grow at the same time. This would be a push out of my comfort zone, put me in front of a new audience, help grow my experience, and exercise my problem solving muscles. I knew that coming up with a simple, quick painting would be a bit tricky. A painting the size of the one I was offering for the paint nite normally takes around 20 hours for me to finish. I tend to get totally lost in the process and time doesn’t usually matter that much….The time-frame for everyone to complete this project was approximately 2.5 hours! The first thing I did was to sketch out a few possible design ideas. The criteria was that the image had to be colorful, have a pleasing composition in a garden theme, and be simple enough for unpracticed painters to create. Checking out paint parties on the internet and talking to people who had attended similar events really helped to wrap my mind around how to make this as good an experience for the participants as possible. Writing down lists for supplies and methods of approaching the project really helped me to get started. It also helped to have some recent teaching experience. More cost effective ways to paint would have to be explored because artist quality materials are quite expensive. Using supplies unfamiliar to me, meant that it would be important to use the exact same paints and brushes etc. as the attendees were going to be using. I had to understand fully how everything worked and how to solve the problems that might arise ahead of time. It was also important to incorporate as many environmentally friendly features into the project as possible. Consideration was given not only to the cost of supplies ( to leverage fund-raising efforts) but what would happen to the used resources afterwards? Leftover paint would be scraped into a container for use later in my studio; recycled paper towels were sought out and dollar store brushes would be carefully cleaned for re-use. Used paint water was to be collected, brought home to settle in a pail, and later taken to the eco station. Because they are easily recycled, tin foil pans were chosen for the paint palettes. All of the packaging materials would be recycled as well as the paper covering the tables. As little plastic as possible was used for the project. These environmental efforts by no means take care of the waste and footprint problem perfectly. But, they are an attempt, at least, in the right direction. I felt that this way of doing things would also fit with the concerns of the group I was serving as well as my own. Initial Paint Night ideas that I didn’t really like. I painted a couple of my design ideas, but was not thrilled with any of the samples that came from those efforts. Searching for another simple, but colorful spring inspired concept was challenging. One evening in my studio, I turned around and noticed the miniature painting on my windowsill which had been completed a few weeks earlier. Why not try that design with a few changes? The event organizers decided that this was the most exciting project I had submitted. The only problem was that it took me longer than 2 hours to paint…. I had to practice this painting 3 times over in order to find shortcuts and the best way to demonstrate the method. A friend volunteered to come over and be my guinea pig. We had a great time and it only took about 2 hours and 15 minutes to coach her through it. That would have to do, it should all work out great! Little did we know that life would throw a slight curve ball the evening of the event…. Having everything loaded up a few hours ahead of time made for a lot less stress! I am learning not to leave things to the last minute…. My daughter, Jilene and our friend and event organizer, Jill, would be my assistants during the event. We we pretty sure that we had thought of everything. Even hair dryers to speed up paint drying time, just in case. Jill and Jilene would make sure everyone had enough supplies and refreshments (wine! ), answer questions and help clean up. I would concentrate on the painting part. All the bases were covered. As we all know, even with our best laid plans, curve balls can appear out of nowhere. Shortly after we had arrived to set up, the venue’s caretaker asked what time we would be packed up and ready to leave. At the time, I thought this was a rather strange question. We told him that we should be finished with everything by around 9 or 10 pm. He mentioned that he thought we would be done by around 8:30 pm and that he was expected at another event by 9 pm. This was stressful news! We requested and had been approved to use the space until about 10 pm. An hour less would really rush everyone’s painting experience which was what I wanted to avoid. Later we found out that there was a miscommunication with the person who recorded the booking. A lesson learned in double checking the details! 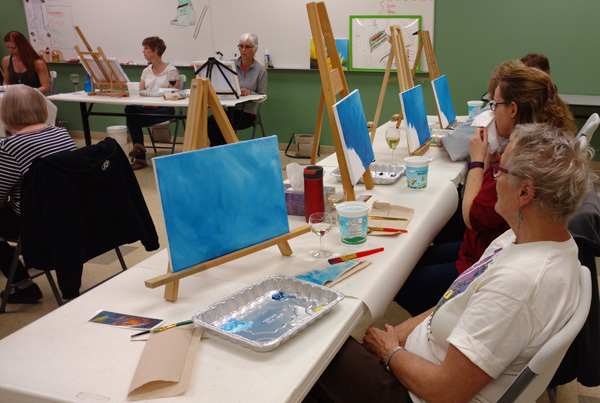 These Paint Night attendees were a tremendous group of ladies! After explaining our dilemma, they were really good about it. Our rushing through did lessen the enjoyment for some, and some did not get their painting finished the way that they had hoped, but it all worked out ok. Someone commented that there was no time to over-think anything! Many of them we so kind as to help pack up the supplies and bring it to my van. With their help it took only about 15 minutes to get out of the space so that the care taker could meet his next obligation. 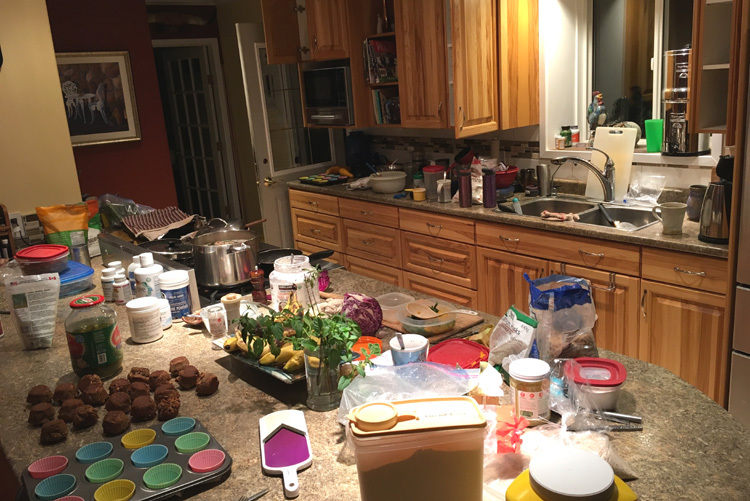 Once home, Jilene and I had quite the mess to sort through; a few hours of scraping paint and cleaning brushes! In the end, it was a great experience. Would I do it again? Well since I have a decent design and most of the ground work figured out…. You might twist my arm. This entry was posted in Teaching/Learning on May 31, 2017 by Judy Schafers. 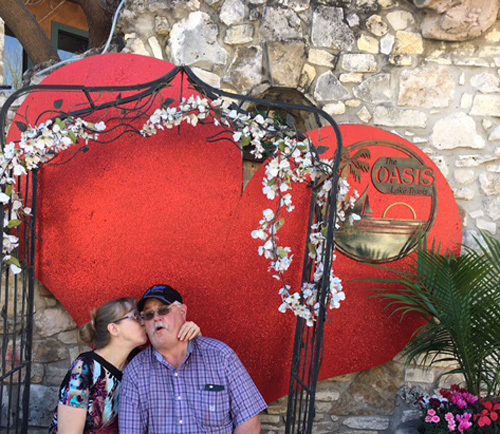 Here are a few fun vacation photos in no particular order, from our trip to Arizona and Texas. Love the Desert in Green! There may just be a painting or two to be created from this experience. This photo was taken in the Phoenix area. 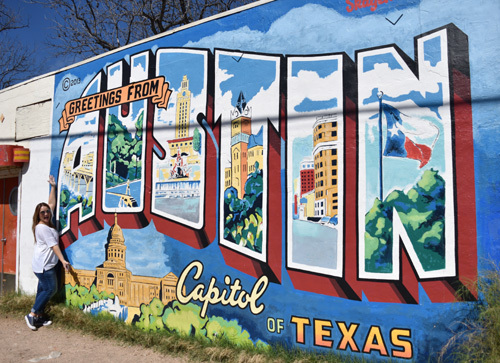 Sister-in-Law, Fran showing of Austin. It’s a Lovely City! She took us on quite a few tours. 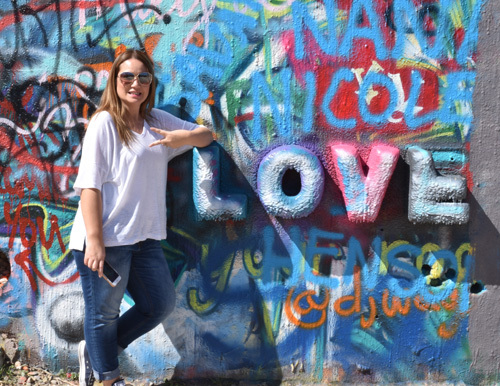 Here is Fran, my sister-in-law, at the Hope Outdoor Gallery in Austin. He acts as if something shocking is happening….. poor guy. He almost had a heart attack, apparently. 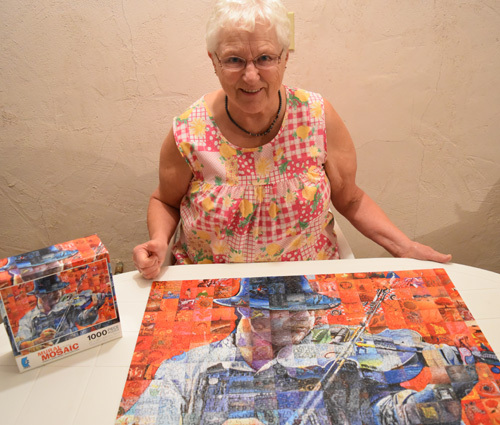 Here is Marian, my mother-in-law, enjoying her 1000 piece Mural Mosaic puzzle. She just loved looking at all of the painted images within the main picture! 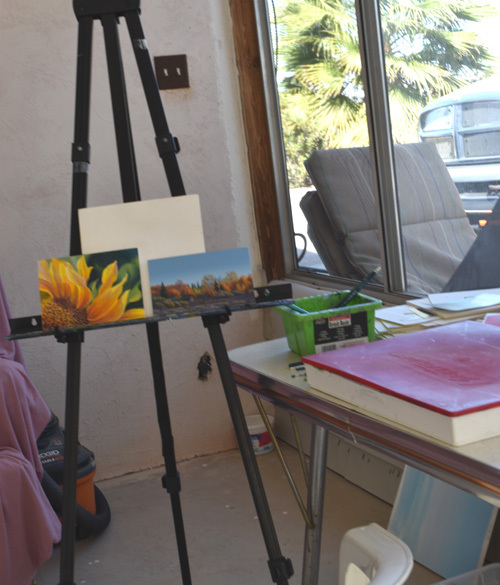 My painting spot in Yuma at Herman and Marian’s home. Rain or shine, this is where I enjoyed many of my holiday hours. A fun family photo of Shane’s youngest brother, Elben (at the top) and his 3 children at the bottom. Shane is second from the top and I am the third. 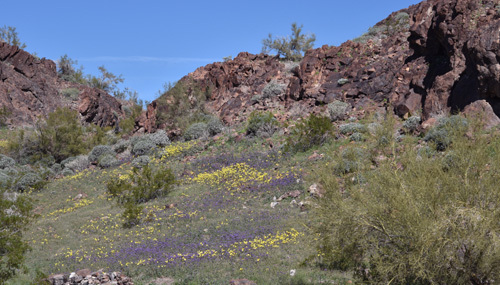 The desert wildflowers were so Amazing!! there were only 2 varieties that I recognized and the rest I had never seen before! I just couldn’t get enough of them. These were simply everywhere. 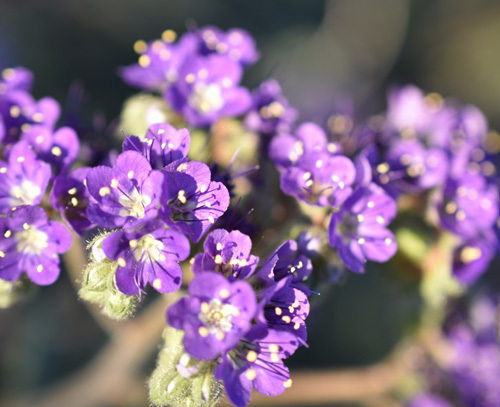 How wonderful since purple is my favorite color! I wanted to pick them, but I felt that they were happier left alone. Hence the dozens of photos…. 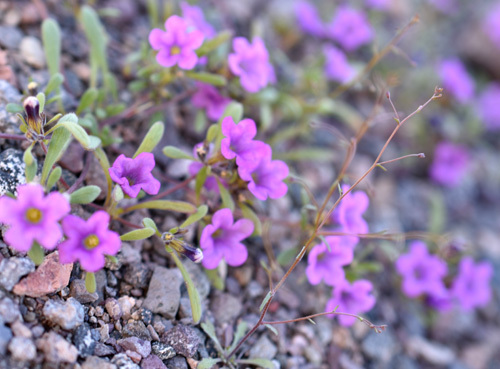 A little flower patch on the rocky hillside. We saw this on our way out of the campground. I have never seen these before and have no idea what they are. This one plant only appeared in one location. 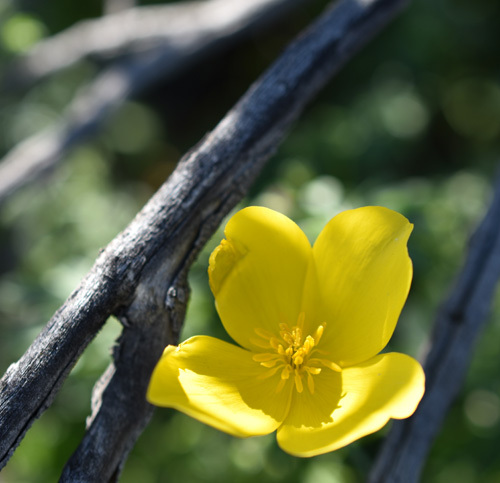 These bright butter cup like yellows were everywhere and most often appeared next to the purple ones. These were so tiny that I had a hard time getting a good photo. Now I see that they strongly resemble petunias! That’s it, folks! Hope you enjoyed the fun vacation photos! This entry was posted in Travel and Art, Uncategorized on March 22, 2017 by Judy Schafers. Glamping out during our inspiring winter getaway in the desert near Lake Havasu City Arizona. Shane and I hit the road with our truck and fifth wheel trailer on January 28 and headed south for Yuma Arizona. It was plus 5 degrees Celsius when we left home but the weather got colder the further we traveled. He was hoping the weather would warm up much sooner. Fifteen hours later, Shane finally decided it was time for some shut eye. We had reached Idaho Falls around 1 am, where the temperature was minus 24 degrees Celsius and snowing! Maybe we were going in the wrong direction? The furnace in the trailer was turned on and we both crawled into bed still wearing our clothes. I didn’t even take off my winter coat! This is not the first time we have slept in the trailer on a cold night. On one trip, we awoke to a snow drift in the bedroom of our trailer….on my side…. It was not quite as bad this time, but it still took me quite a while to warm up and settle in to sleep. As usual, Shane was snoring as soon as he hit the pillow. Parking in a truck stop over night has it’s perks. One of them being noisy diesel engines that can serve as an alarm clock. Thank goodness for my earplugs! We were up and on the road again by about 6 am. The highways were in good shape and we made it to Lake Havasu City the next night. We thought we’d just camp out in the Walmart parking lot at the northern edge of town, since it was already 9 pm. It has become well known in RV circles that Walmart welcomes short term campers, so this idea is not unusual. But it is something that does not sit well with a growing number of municipalities. Shortly after we arrived, we were approached by a security guard who told us that we were not allowed to park there over night. He was very nice about it and gave us a card with info about other places we could stay. One suggestion that the guard gave us, was to head north for a mile to find the entrance to a government owned free campground in the desert. It was pretty dark and we almost missed the driveway. Down a really curvy, narrow gravel road we slowly drove. With really huge boulders gleaming in the moonlight, crowding in on the narrow path, Hubby was getting a bit nervous. What have we gotten ourselves into? Even a pro trucker like Shane can’t necessarily turn a big rig around in a tight spot in the dark. As we went along this cow-trail, we noticed a few Rvs parked along the sides and managed to find a spot that was in a more open area to settle in for the night. 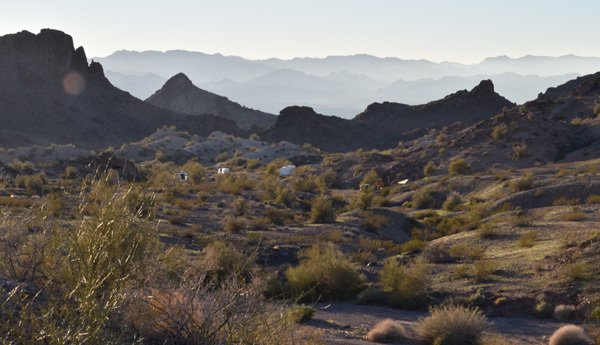 Glamping in the desert near Lake Havasu City. 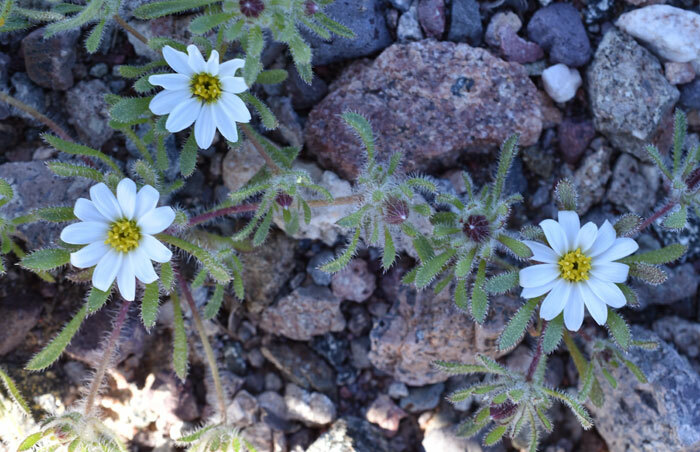 The next morning, we were greeted with warm sunshine and the colorful desert wilderness. Shane and I decided to hang around for a few hours because it was so quiet and peaceful, but we had no food or water to speak of. A trip back to Walmart was in order; to gather a few groceries, water, and maybe look up a neighbor friend who was supposedly staying at an RV resort in town. Since we needed to fill our water tanks, we thought it best to find that RV resort and stay there for a night or two, depending on how much we liked it. On the way out of this campground we saw how truly beautiful this place was. The rock formations and desert plants were so inspiring and it was fun to think about sitting in the desert and painting what was in front of me. An activity I rarely have time to do on the farm. Finding the RV resort we were looking for, we decided to check and see if there was room there for us, even though our friend had already left for Alberta. It was right on the shores of Lake Havasu and was a pretty nice looking place. We had never parked in an RV resort before and had no idea what it was like. Truck stops, Shane’s parent’s place in Yuma and Alberta campgrounds were about the extent of our glamping experience. We were asked by a friendly gate attendant to park in a special lot and go into the office. After answering some of our questions, the office clerk asked what year our trailer was. Shane told her that it was a 2005 model. “Oh… well, then we will have to inspect it first. There shouldn’t be a problem,” she said. What?? The manager returned from his inspection and told us that if we were only staying one night, then it was ok for this time only. If we wanted to stay in their resort again, the decals on our trailer would have to be replaced. They were beginning to fade and crack… After all, this is a five star resort…. Interesting. We had never heard of such a thing before! Seventy-two US dollars a night seemed a bit steep in our opinion, so we decided to just try one night for the heck of it. We needed water, a shower and a proper supper anyway. Turns out, we didn’t think it was really worth it because the RVs were packed in like sardines, it was quite noisy and the promised internet was crappy to boot. This entry was posted in Travel and Art on March 22, 2017 by Judy Schafers. Mysteries under a blanket could refer to a few things…. You can guess what I am actually thinking about here. Nothing naughty…. I absolutely love the mystery that a fresh blanket of snow creates as it is laid over the varied contours of the garden, field and forest. Each snowflake joins together to form beautiful marshmallow-like shapes and hollows. 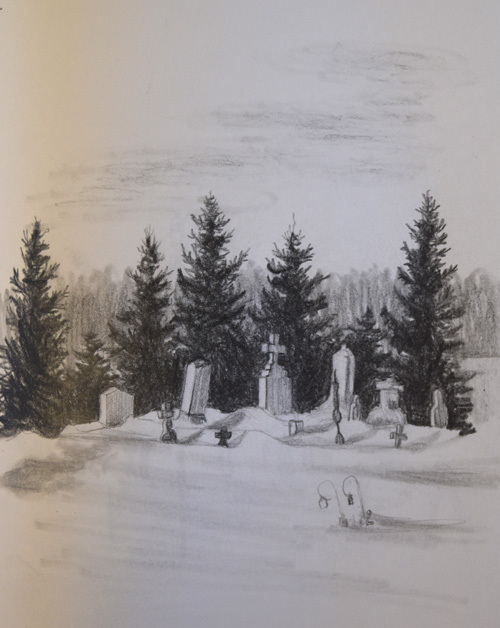 These little vignettes evoke questions in my mind about what the snow might be covering. Is there a creature or two hiding under there? Why else would I spend time in the dead of winter, searching for inspiration, while having to endure frosty fingers and a runny nose? It would be a shame to miss such wonderful things to contemplate: soft, yet frigid shapes, cold shiny crystals and diamonds, sculptural, temporary, ever changing, ethereal. And then one day, usually without fanfare, they are gone. Such fleeting beauty is worth exploring and capturing on canvas. At least I am not required to paint it stationed outdoors in the sub-zero temps! I am not sure I am THAT dedicated…. The digital camera does a great job of capturing enough of the detail for me to work with in the comforts of my studio. My fingers are saved! It is a fun challenge to create pillow-y soft looking shapes on a flat surface. Layer by layer, the canvas takes on a 3-D look. We generally think of it as white, but it always amazes me how much color can be found in snow. The colors will vary each day, location and time of day. All of the subtle arrays of hue take time to see, understand and add to the painting in just the right amount in the right place. My aim is not to copy the photo, but to make my painting look ‘believable’. Put a layer of paint on the canvas and add another color or shape. Oops! I’ve made a mistake. I will then try to block it out with more layers and then enhance what’s working. Eventually something lovely is created through this push and pull process. Mysteries under a blanket are always interesting to think about and will inspire me for years to come. This entry was posted in Uncategorized on December 29, 2016 by Judy Schafers.